What Have You Carried Over? “Gülten Akın’s work spans sixty years of often turbulent change in the society and politics of her country, marked dramatically by three military coups in 1960, 1971, and 1980. It reflects both the frustrating conflicts and the quiet moments of her private life as a wife and mother of five, but also her unwavering commitment towards upholding social conscience as a universal value against injustice and inequality. Her deeply ingrained Sûfî beliefs surface too, especially in her later poems. In this selection of Gülten Akın’s work, the first to be published in English, the reader will find translations that represent only some of the poems in twelve of her major collections. 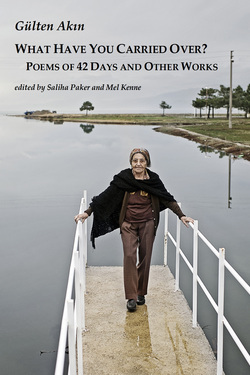 Poems of 42 Days is translated in its entirety and holds a central place in this volume, as it does in her Turkish corpus of poetry. Saliha Paker is Professor of Translation Studies and a literary translator. She founded the Cunda International Workshop for Translators of Turkish Literature in 2006. Mel Kenne is a poet and translator who retired recently from his position as Lecturer in the Department of American Culture and Literature at Kadir Has University, in Istanbul, Turkey, where he still lives.